Airlines transport more than 3.7 billion passengers annually, and air traffic volume is projected to continue growing at an annual rate of 4.6% and more than double in size (by a factor of 2.4) over the next two decades. * On the other hand, there are growing concerns about increases in aircraft noise and emissions such as CO2, making the need for aircraft that are both more environmentally friendly and more economical greater than ever. In the field of civil aviation, economic efficiency and environmental performance represent key factors in market competitiveness. The ECAT program aims to develop and mature advanced technologies that can reduce aviation's environmental impact by making collaborative efforts with industry partners. Major R&D under the ECAT program includes 1) core engine technologies for ultra-high bypass engines, 2) engine noise-reduction technologies, 3) airframe noise reduction technologies for landing gear and high-lift devices, 4) low-drag and low-noise airframe technologies, and 5) technologies for reducing overall weight through expanded use of composite material. The ECAT program will thereby contribute to creating a sustainable and prosperous society and support further growth of the Japanese aviation industry while enhancing its competitiveness. The purpose of the FQUROH mission is to reduce airframe noise, a large fraction of which comes from high-lift devices (flap and slat) and landing gears, and to verify the feasibility of practical application of airframe noise reduction technologies through flight demonstration. With emphasis on increasing the environmental performance of airframes, we are developing　“Drag reduction technology” and “composite structure design technology”,　as well as “System evaluation technology” that can evaluate the performance of an airframe with these technologies. 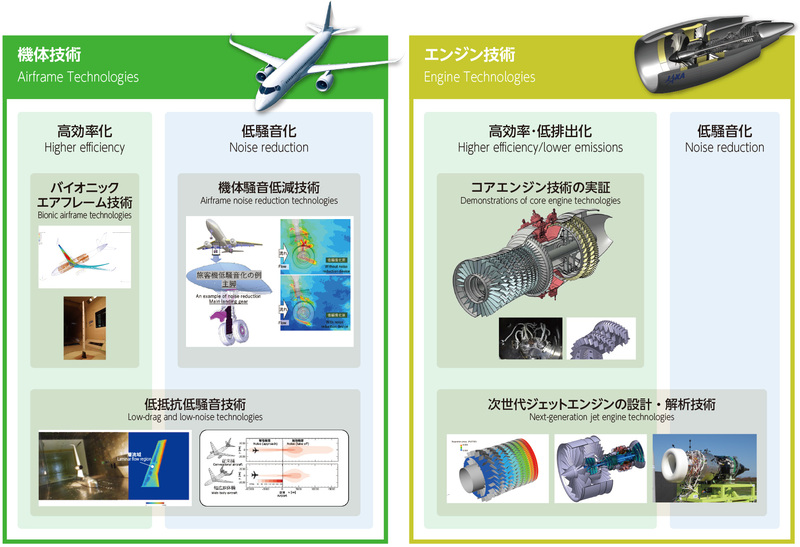 To further improve environmental performance of jet engine, we develop and demonstrate technologies that are necessary for core engine and engine noise reduction. FLIGHT PATH No.1/2 "Working with an eye toward needs 10 years down the road"